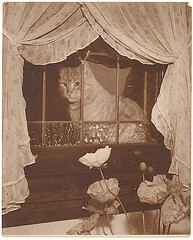 I'm creeping in your window...snatching up all your catnip. First and foremost at Caledon Virtual, we love cats. Seriously. Fluffy cats, Siamese cats; doesn’t matter. Cats, cats, cats. Second of all, we’re business people (Wait a moment. I’m being told we’re not fans of cats at all. Well…that’s a bit awkward…). As business people though, we are members, and huge fans, of the Columbia Chamber of Commerce. The Chamber’s annual banquet was held this past Wednesday night, which could spawn it’s own list of FollowFriday’s. Valerie Russell, Paul Land, Outstanding Businesswoman of the Year Michelle Spry and Outstanding Citizens of the Year Al and Marjo Price, just to name a few people recognized. The Chamber is the pulse of the business community here in Columbia, not to mention our advocate in business matters in front of the City Council, County Commission, and the state government. It is our front porch to new businesses, and leads the fight to bring new businesses to Columbia. Don Laird and his team have done an incredible job at the Chamber. We’re proud to support them and their efforts. We’d encourage you to engage with them on Twitter, Facebook, their website, and in person.